Wyclef Jean joined forces with Prescribed and J.Williams to produce a tribute song for the slain 17-year-old. 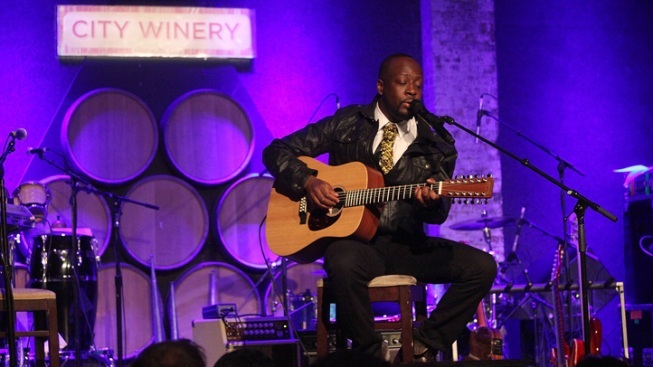 Wyclef Jean, pictured here performing at the City Winery in New York City, released a tribute track, called "Justice," in wake of the shooting tragedy that killed 17-year-old Trayvon Martin. Wyclef Jean is joining the ranks of Chaka Khan by weighing in on the Trayvon Martin case through music. The Haitian-born Jean teamed up with Prescribed and J. Williams to produce a track titled “Justice (If You’re 17),” in memory of Martin, who was shot to death in February by neighborhood-watch volunteer George Zimmerman. Inspired by the events, Wyclef sings "If you're 17 with a hoodie on/ Watch out for the neighborhood watcher/ If you're at the right neighborhood at the wrong time/ Neighborhood watcher/ This might be your last call to your girlfriend/ The neighborhood watcher/ Man I feel for you if you're 17." In addition to the track, which was released Friday as a free download, J. Williams and Prescribed also produced a short video called “I Am.” The short delves into the Trayvon Martin case and touches on the issue of profiling. A music video for “Justice” is slated to be released April 20.